We are part of a generation of couch potatoes who grew up watching David Letterman and Jay Leno battle it out for late night supremacy. The two, no doubt, have had quite a run, with both exerting much effort to outdo one another with every episode. Of course, in the end, the fans are the clear winners, beneficiaries of years of laughter and entertainment. With David and Jay having moved on, the late night landscape has been enjoying a brewing renaissance. Nowadays, fans are actually spoilt for choice, with late night shows coming in a variety of formats. Which one's for you? You decide. Hosted by writer and comedian Conan O'Brien, Conan started airing in 2010. It's the one late night show that follows the format established by Johnny Carson and David Letterman, including the traditional opening monologue. In fact, the show also has its own exclusive musical group in the Legally Prohibited Band as fronted by longtime guitarist Jimmy Vivino, very much like Letterman having the World's Most Dangerous Band as led by Paul Shaffer. It draws laughs mainly from news stories, political figures, and celebrities. Conan pulled in great ratings early on, reaching a peak of 914,000 average viewership in 2012. But with the arrival of more inventive late night competitors by 2015, Conan would see its viewership dip into the low 299,000 average. Like Conan, The Tonight Show Starring Jimmy Fallon also started out very traditional, but this time aping its predecessor show hosted by Leno. It would eventually evolve into something almost akin to Saturday Night Live with more sketches and music. A big hit among its many young fans is its many inventive and fun games that feature celebrity guests. The most popular of these, "Lip Sync Battle," actually became a show on its own. Then there's Fallon's hit impersonation of musical legends like Neil Young and Jim Morrison. Following its premiere, the show consistently won in the ratings game, routinely beating competitors like Late Show with David Letterman, Conan, and Jimmy Kimmel Live! However, beginning early 2017, it was dislodged from the top position by The Late Show with Stephen Colbert. Among the longest running late night shows in American TV history, Jimmy Kimmel Live! started airing in 2003. It took awhile for it to gather steam, failing to catch up with the popularity enjoyed by competitors like The Late Show with David Letterman, The Tonight Show with Jay Leno, and Late Night with Conan O'Brien. But it gradually earned a spot in viewers' hearts with the introduction of new segments, including some impromptu ones invented by Kimmel like his running "feud" with Matt Damon and Kanye West. There is also, of course, Mean Tweets, which has also made it big online. The show could be classified among more "excitable" of its ilk, in as much as it is seemingly willing to go great lengths to come up with gimmicks that would endear itself to fans. 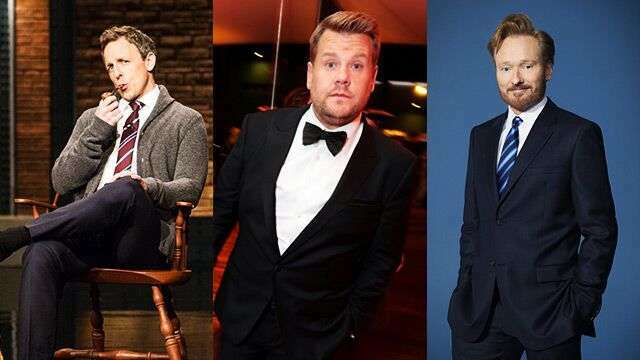 These gimmicks could be cheesy at times but no matter, The Late Late Show With James Corden has earned a considerable following since it started airing in 2015. Unlike competitors, Corden is not a comedian per se, but he is making good use of his theater and singing background to create a more musical iteration of the talk show format. The show leads its rivals in terms of inventive segments, among them Carpool Karaoke, Drop the Mic, Crosswalk the Musical, and Spill Your Guts or Fill Your Guts. All that said, Late Night with Seth Meyers still beats The Late Late Show in ratings weekly. The current king of late night, The Late Show With Stephen Colbert is the official successor to Letterman's show. Actor-writer Stephen Colbert was picked to replace Letterman exactly to compete with Fallon, who is noted to have already captured a wide demographic at that point. As ratings would prove, the move was quite a success, with Colbert earning a huge swathe of young audiences alienated by Letterman. The show retained much of what worked on Letterman's version of the show including that of having a house band in Stay Human as led by bandleader Jon Batiste; but with a few tweaks including having sketches just like that of Fallon's. A big hit for the show is its fake news segment, a carry over from the successful The Colbert Report, which was what landed Colbert the opportunity to host the show in the first place. In terms of ratings, The Late Show With Stephen Colbert trailed The Tonight Show Starring Jimmy Fallon early on. It wrestled the lead following the inauguration of Donald Trump as US president in January 2017. The show premiered in 2014. Like most talks shows, it contains comedy bits, sketches, interviews with guests, and a musical or comedy performance. It has since evolved into something similar with The Daily Show, focusing more on politics. A Closer Look is a popular segment, where Meyers discusses current events. The show is described as a combined late-night talk and news satire program. The format was originally popularized by Jon Stewart, who hosted the show from 1999 to 2015. Noah has since implemented many changes on the show including an updated set and new graphics. Now, unlike other late night hosts, Noah use a lot of more millennial based references, impersonations and characterizations, further strengthening his hold on the show's core audiences whose ages range from 18 and 49. Andy Cohen is very much like Kimmel, brave with the questions he asks his guests. It could sometimes be a bit embarrassing for the guests, but luckily for Cohen none have walked out on him...yet. Watch What Happens Live With Andy Cohen is often fun, spontaneous and yes, engaging. It is also interactive in that it takes live calls from viewers, asks guests questions tweeted to the show, and conducts online live polls. None of the competitors have that. Locally, nobody can top Boy Abunda as an interviewer. He is engaging, personable, and witty. That said, there are times when he gets lost in his own stardom. We always cringe hearing him acknowledge his loyal set visitors as the Abundants. As for the show itself, it is basically a self-serving platform for ABS-CBN to crow about their own shows and actors. Sure, it gives a run-down of daily top entertainment stories, but mostly those involving ABS-CBN talents. A favorite among fans is the Fast Talk segment, which, depending on the guest, could actually be exciting or boring. Tonight With Arnold Clavio is GMA trying to mount a Letterman type of talk show in a very Pinoy manner. Like Tonight With Boy Abunda, however, it only goes as far as the network wars will allow, with guests mainly being from the Kapuso side of the fence.